Cranky Kong's Shop is a shop run by Cranky Kong in Donkey Kong Country Returns and its Nintendo 3DS remake, Donkey Kong Country Returns 3D. It serves as the successor to Cranky's Cabin from Donkey Kong Country. There is a shop in each of the eight worlds, although they all carry the same selection of goods at the same prices. Many useful items can be purchased at these shops in exchange for Banana Coins. Although most of what Cranky sells is not mandatory, he does sell a key in each world, which will open up an alternate path on the map, allowing the player(s) to access additional levels. This is required for completing the game by 100 percent. As with previous games, Cranky will sometimes complain about his situation such as needing Banana Coins, being stuck in a shack, or how the game is "too hard" for Donkey Kong and Diddy Kong. He often makes snide remarks about the items purchased by the player(s), and frequently alludes to the Golden Temple. If the player(s) currently have a maximum number of 99 lives, Cranky refuses to sell an Extra Life Balloon to them. Likewise, if the player(s) buy a key, they cannot purchase it again. 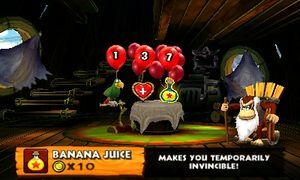 The shop was replaced by Funky's Fly 'n' Buy in Donkey Kong Country: Tropical Freeze, due to Cranky Kong becoming a playable character. 1 Life Balloon x3 Grants one Extra Balloon. 3 Life Balloon x7 Grants three Extra Balloons. 7 Life Balloon x15 Grants seven Extra Balloons. Heart Boost x10 Adds one Extra Heart to your Heart Count. Squawks x15 Squawks helps you find Puzzle Pieces. Banana Juice x20 Makes you temporarily Invincible! Map Key x20 This key opens a locked path in this World. Crash Guard x10 Makes your Mine Cart or Rocket Barrel temporarily invincible! DK Barrel x5 Allows you to use a DK Barrel any time. The Banana Juice potion could be an allusion to Donkey Kong 64, where Cranky was a scientist who crafted potions for the player. 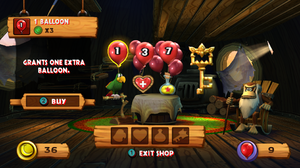 In the Image Gallery, a concept artwork of Cranky's Shop shows he had only one balloon for each amount of lives, and in different colors. If the player doesn't select an item from the shop for a while, Cranky will get tired and fall asleep. Only in the Nintendo 3DS remake, if the player is playing New Mode and waits on the Portable DK Barrel long enough, Cranky will make a The Legend of Zelda reference saying, "It's dangerous to go alone! Buy this! ", substituting "Take this!" with "Buy this!". This page was last edited on February 28, 2019, at 17:26.